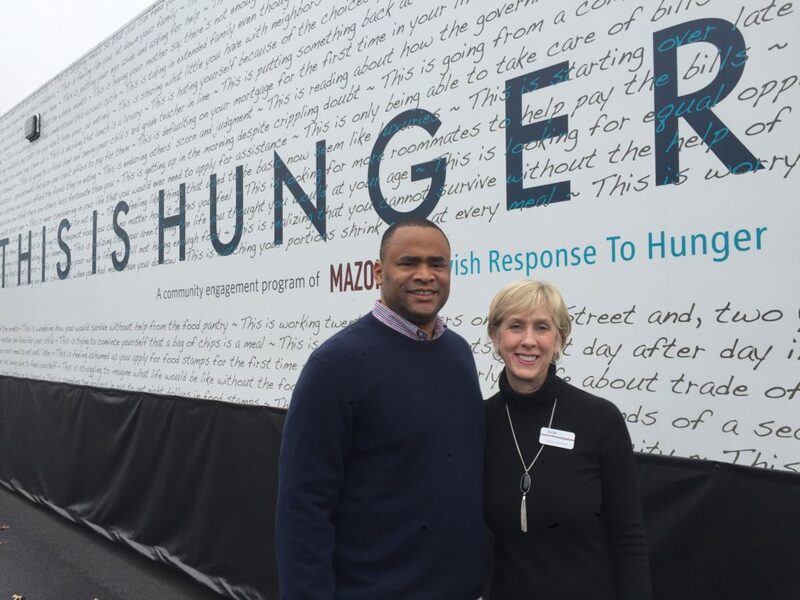 Democratic Congressman Marc Veasey and Shirley Davidoff in front the Mazon traveling exhibit at the Aaron Family JCC. Rep. Veasey, who represents the 33rd District, accompanied Fort Worth Beth-El religious school students to the exhibit Sunday. Davidoff is the chair of MAZON’s national board and first vice president of Congregation Shearith Israel. DALLAS — Just how big is the nation’s problem with hunger, and what can be done about it? That’s part of the conversation the “This is Hunger” exhibit hopes to bring to the forefront as it travels around the country. And the answers to those questions, according to MAZON: A Jewish Response to Hunger — 42 million Americans go hungry, and advocacy must go well beyond donations. The exhibit from MAZON, a 53-foot-long double trailer, operates like a state-of-the-art rolling museum. 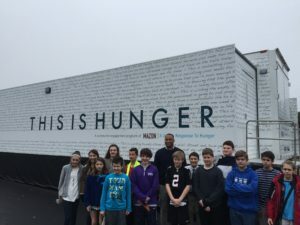 It spent five days last week in the JCC parking lot on a visit sponsored by Temple Emanu-El and the JCC. “It’s very, very powerful. It leaves a huge lump in your throat,” said Irene Kogutt, who saw the exhibit on its first day here. The interactive experience combines numerous interviews and recordings of Americans struggling with hunger, taken by acclaimed photographer Barbara Grover, with the latest numbers and analysis from federal data. LED wall projectors, supplemented by projectors from the ceiling and table, add to the immersion experience designed under a team led by Marni Gittleman. The project took about five years and cost $1.7 million to assemble, curate, and put on the road for 10 months. Shirley Davidoff, chair of MAZON’s national board and a former member of the Dallas JCRC executive committee, said the organization decided to take a leap of faith and try something different. 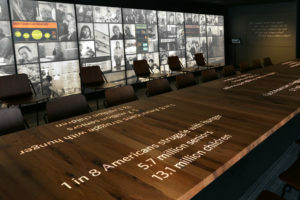 Up to 30 people at a time can experience the 14-minute opening presentation, where visitors sit at a table and encounter the faces and voices of hunger in America. The way the presentation works, it appears as though some of the speakers are sitting at the table as their words echo. After the presentation, visitors can explore the photos and graphics lining the inside of the truck, try a work sheet to see how they would feed a family on federal assistance (“It’s a lot more than you think it will cost,” Kogutt said), use a social media photo booth, read personal accounts of hunger, sign a petition to protect benefits, or make a donation. The statistics and graphics give a lot of attention to groups often overlooked when it comes to hunger. One in four veterans of the Iraq and Afghanistan wars are hungry or otherwise food-insecure, according to the data. There are food pantries operating at or near every Navy and Marine base in the country. Many military families are actually ineligible for help because of their housing allowance. “I thought at first she meant the retired, the veterans, and to realize it is ongoing, that was alarming,” said Melanie Rubin, the Dallas JCRC chair. Just before the tour launched out of Los Angeles, photographer Grover got to see the final product, and was impressed. “I went to it several times with members of the community, students of different ages, and most people are very moved and also moved to do something about the issue,” Grover said. “And I think the truck gives them some of those resources. Tour facilitator Maya Joshua said she has seen many people moved by the exhibit. She said one 7-year-old tried to use one of the exhibit’s iPads to make a $1,000 donation per month. But donations aren’t enough, MAZON officials say. One of the biggest challenges, according to MAZON, is that charity and food banks, while essential, cannot solve the problem on their own. The largest anti-hunger organization’s budget, according to MAZON figures, could feed every hungry American for less than two weeks, even at $1.66 per meal. Davidoff and Stuffmann praised the work of food pantries on the front line of hunger, but called for a look at the bigger picture. “What we are looking for is scale, and to stem the tide of people who go to food banks on a regular basis, to shorten the lines at soup kitchens,” Stuffmann said. “Food banks are not a solution, they deal with a symptom, not a cause. One example of what federal assistance can do is even more personal than the striking photographs. Craig Schneider, the driver and technician for the truck, is an employee of Mobile X Events. He has been in the business of marketing, especially mobile events, for 40 years. He also went hungry after a heart attack. “Six months out of work. Where would you be if you were cold flat for six months?” Schneider asked. He and his family were facing medical bills for years afterward, and had to turn to federal assistance to eat. Now 64, Schneider is back on track, although a few years after he had planned to retire. “He was selected based on his experience,” Stuffmann said. “The fact he has something to do with the issue was not known by MAZON until after that point. Schneider said one visitor recognized a fellow member of the military in a photo on the truck’s inside wall. And another person whose story is highlighted, Joaquin, has become a well-known hair stylist in Los Angeles. “A lady in Los Angeles came in and said, ‘What is my stylist doing on the wall?’ ” Schneider said. The numbers are staggering, and that can be an issue, Stuffmann said. Grover was commissioned for precisely that reason. MAZON knew it wanted something special to personalize the issue, and she specializes in economic and social injustice. Grover worked hard to distill the years’ worth of interviews and recordings into a workable presentation. Each location had presentations for the public as well as reserved times for groups, such as schools. 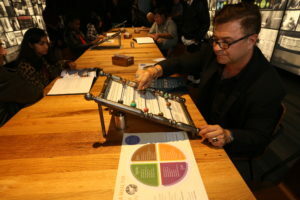 There were about 25 public sessions during the Dallas stop. Davidoff, who is also a board member of Congregation Shearith Israel, noted that Texas has a higher food insecurity rate than the national average, 15 percent to 13 percent. It’s 25.6 percent for children. MAZON has a number of state-specific projects. In Texas, it has helped expand school breakfasts and is petitioning for summer food programs. It has also been trying to combat the shaming of students whose families have low balances for school meals. The “This is Hunger” tour started in the Los Angeles area in November, and is now on the way to Atlanta. After reaching the East Coast, it will travel through the Midwest and finish in the Bay Area in July. 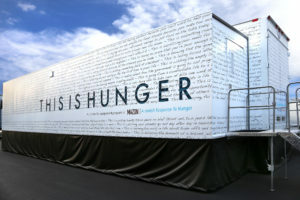 For the complete tour schedule, visit thisishunger.org. As for what happens next, MAZON officials said that depends on the public’s response. While they would love to see the exhibit continue in some fashion, it is too early to make a decision.